PHOTOS: The Many Proposals For President Donald Trump's Border Wall Between U.S. And Mexico : The Two-Way The bidding period has closed for the companies hoping to design and deliver the president's signature campaign promise. Here's a glimpse of some proposals — from wire mesh to 30-foot pipe organs. Despite their common goal, the companies submitting bids have followed some radically different paths in their approach. Among the submissions are walls with solar panels, wire mesh and sloped, slippery surfaces. There are even walls that are no walls at all — statements standing instead as protests of a policy that from the start has drawn a lot of resistance. As NPR's Richard Gonzales reports, the CBP plans to announce the finalists for the contract in June, at which point the companies still in the running would be expected to build a prototype roughly 30 feet long and anywhere from 18 to 30 feet tall. The AP notes the prototypes are expected to cost about $200,000 to $500,000 each; estimates for the cost of the wall covering the 2,000-mile border, however, range up to $38 billion. Here's a glimpse of just a few of the designs vying to stand between the U.S. and Mexico, complete with renderings and explanations of how they could take shape. 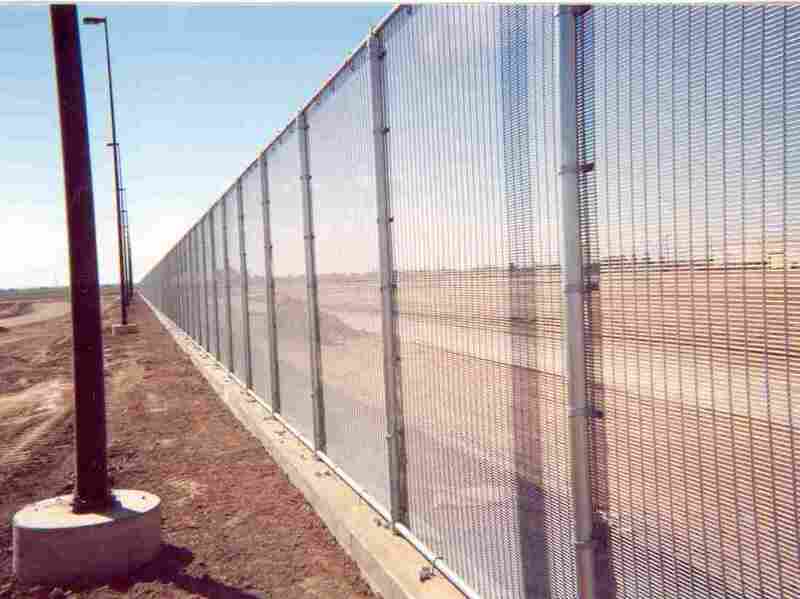 The WireWall fence now in place in California on the border with Mexico. Riverdale Mills says the fence is produced using the same manufacturing process as its "marquee marine wire mesh" designed for lobster traps used in New England. The proposal from Riverdale Mills Corporation employs wire mesh, which is already used along the Mexican border with California and Arizona. Riverdale says the material can be manufactured up to 20 feet tall and installed up to 6 feet below ground, to prevent tunneling. "The configurations of the wire mesh make it virtually impossible to climb or cut," Jane Meehan Lanzillo, director of corporate communications for Riverdale, tells NPR in an email. This rendering depicts solar panels snaking along the border. Gleason Partners, the company behind the proposal, believes that the energy provided by the panels would offer the U.S. a financial boon. "I like the wall to be able to pay for itself," Thomas Gleason, managing partner of Gleason Partners LLC, tells the AP. The company's proposal sets solar panels on sections of the wall, generating what it says would be approximately 2.0 megawatts of electricity per hour, according to the wire service. The Penna Group rendering, which displays two groups on either side watching each other through the mesh. Composed of high-density steel packed into double wire mesh, the Penna Group's proposed wall takes its cue from maximum security prisons. "Nearly impossible to climb," it would also be built to withstand pick axes, acetylene torches and other handheld weapons, with the first 12 feet of its 30-foot height packed more densely. Michael Evangelista-Ysasaga, CEO of the Penna Group, speaks to the aesthetics of the U.S.-facing side of the wall, telling NPR "the wire mesh panels will be emblazoned with the Seal of the United States." 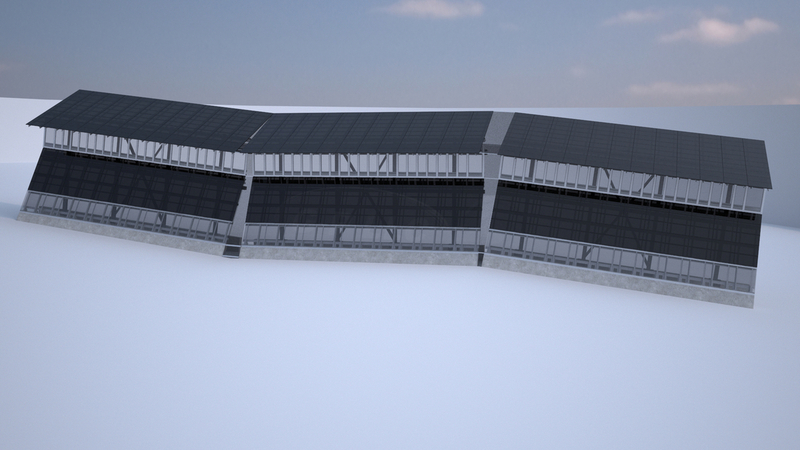 Between its sloped surface and the walkway near the top, the security curtain wall aims to make climbing an impossible task for those seeking to cross the border. 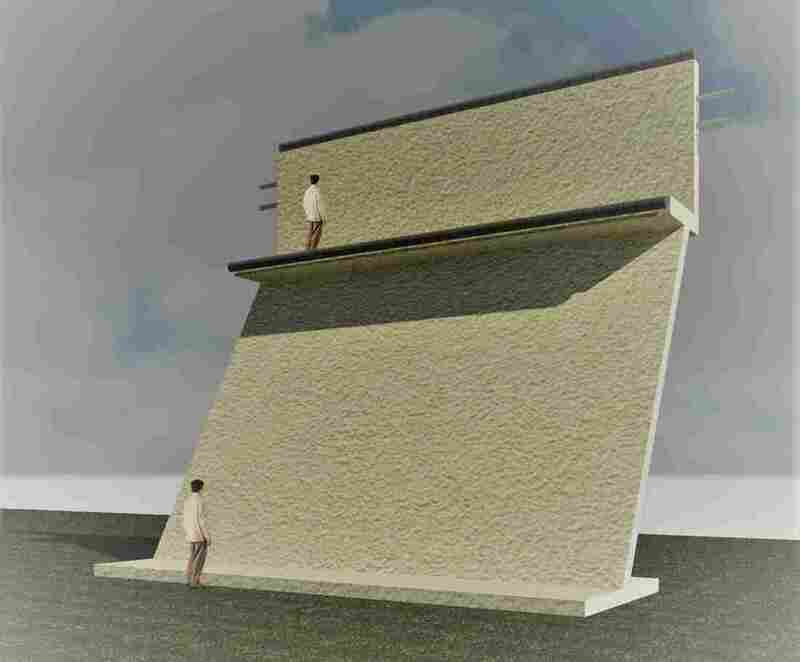 With its face pitched at an angle, the proposed wall put forth by San Diego Project Management, PSC, borrows medieval concepts to give to give guards a better view of possible "villains" approaching the wall — and with its walkway toward the top, it gives those guards a place to patrol from a height. "The surface finish on the south side of the wall is of the same quality as the finish on a smooth floor slab," Patrick J. Balcazar, principal and managing partner at SDPM, writes in his proposal. "Smooth surface on the glacis [sloped] and [vertical] surfaces make climbing harder, and there are no handholds." Hadrian Construction Company's wall, here modeled in miniature, would be paneled according to its Tridipanel system. It's impossible to avoid: For a man bidding to build a massive wall, Rod Hadrian has a rather serendipitous name. 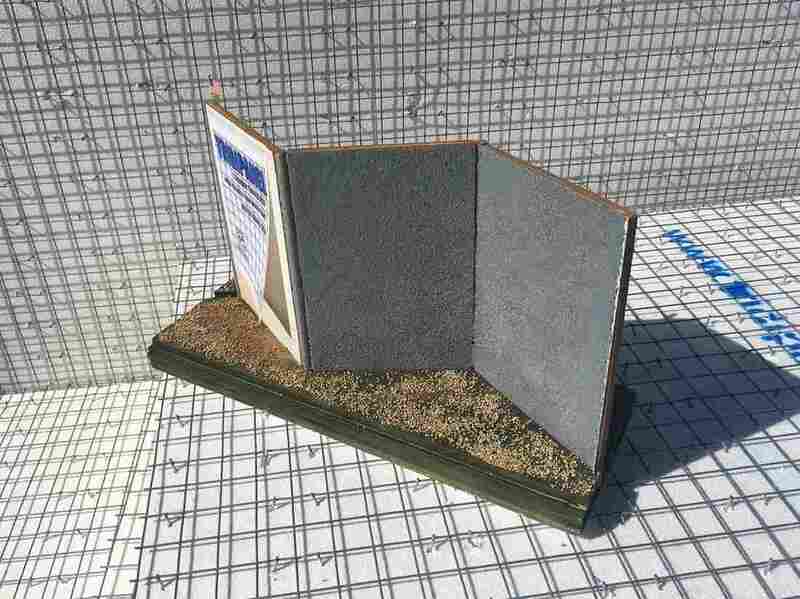 Namesake of the Roman emperor who built the wall that once marked off the northernmost edge of the ancient empire — the wall that still stands in ruins in the U.K. today — Hadrian Construction Company has proposed a wall constructed in prefabricated panels. Its Tridipanel design makes for something of a zig-zag shape, which he says would create a 30-foot wall that's at once lightweight and strong. This is a close-up rendering of the iCON Wall Solution by Concrete Contractors Interstate. 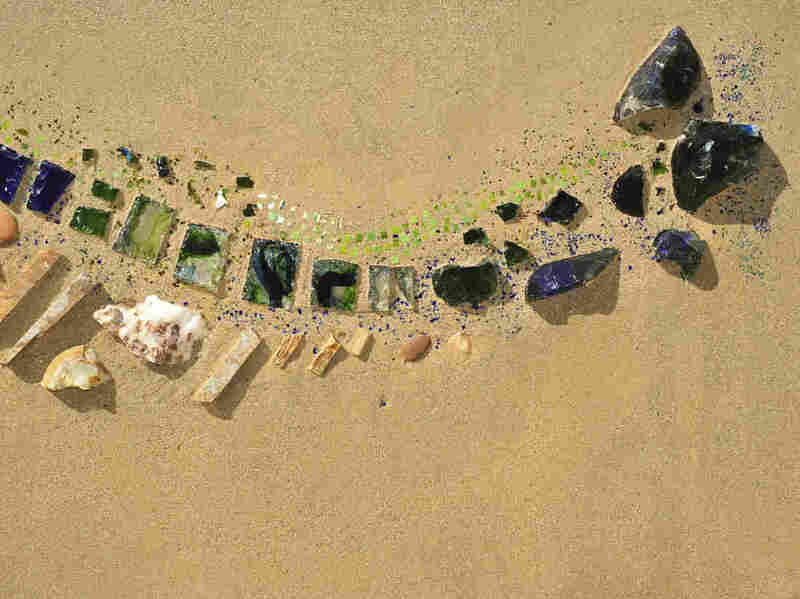 Between the polish and the stones, the company behind this proposal wants to make it as easy on the eyes as it is hard to cross. The border wall should be "a piece of art," Russ Baumgartner, CEO of Concrete Contractors Interstate of San Diego, tells the AP. 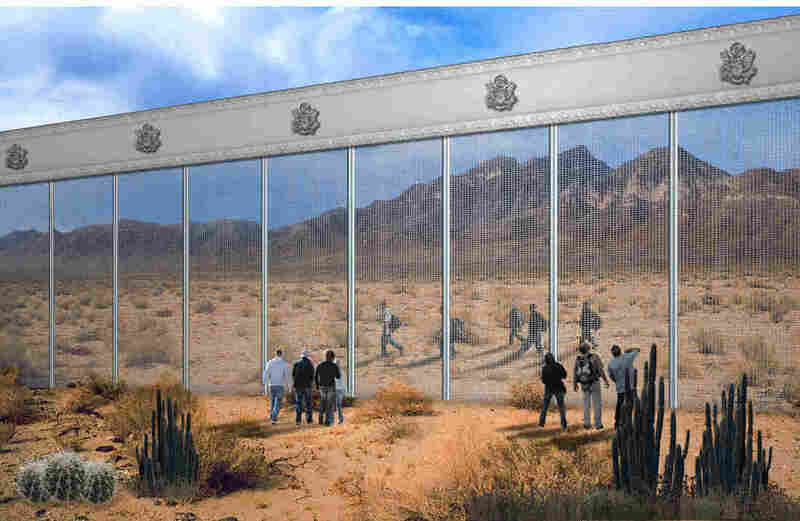 The wire service says the company's proposal calls for stones and artifacts set in polished concrete, reflecting the areas the wall wends through and rendering both sides "aesthetically pleasing" — unlike the CBP's callout, which asks only that the U.S. side be pleasant to look at. Above, you can see a detail of the kind of decorative stones Baumgartner has in mind. Quite unlike the other proposals on this list, the Otra Nation concept condemns barriers altogether. Rather than impede movement between regions, its hyperloop transit system would accelerate travel, effectively rendering the border moot. It is reasonable to conclude that this proposal is not exactly what Trump has in mind for his signature campaign promise. "We propose a trans-national 'New Deal' to build an innovative shared co-nation based on local economic empowerment, energy independence and revolutionary infrastructure and transit," says the MADE Collective, a cross-disciplinary team that argues for the creation of what it calls the Otra Nation — a "regenerative co-nation shared by citizens of both Mexico and the United Stated and co-maintained by respective governments." 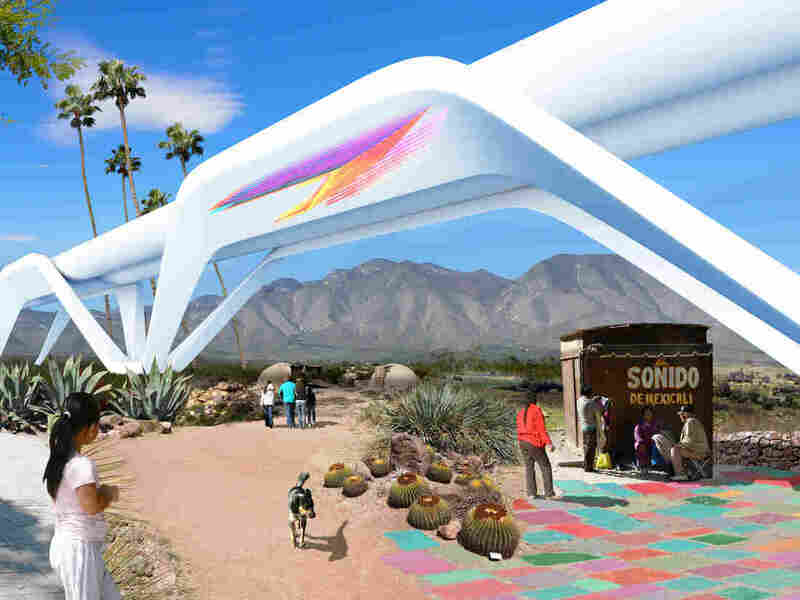 Far from a boundary between two states, the Otra Nation proposal envisions the construction of a hyperloop transit system and the rights to cross open borders of the three North American countries without impediment. One of at least three protest proposals ginned up by J.M. Design Studio of Pittsburgh, this one calls for "a semi-continuous wall of nearly 10 million pipe organs." The long line of 30-foot organs breaks in regular intervals, offering border-crossers the opportunity to walk straight through — but not before playing a ditty of their choosing. Jennifer Meridian — an artist who says Trump's actual border wall is "preposterous for so many reasons," according to the Wall Street Journal — also proposes a wall of hammocks and a wall of refugees' gravestones for passersby to "consider the danger, terror, and horror they must have faced in trying to cross."